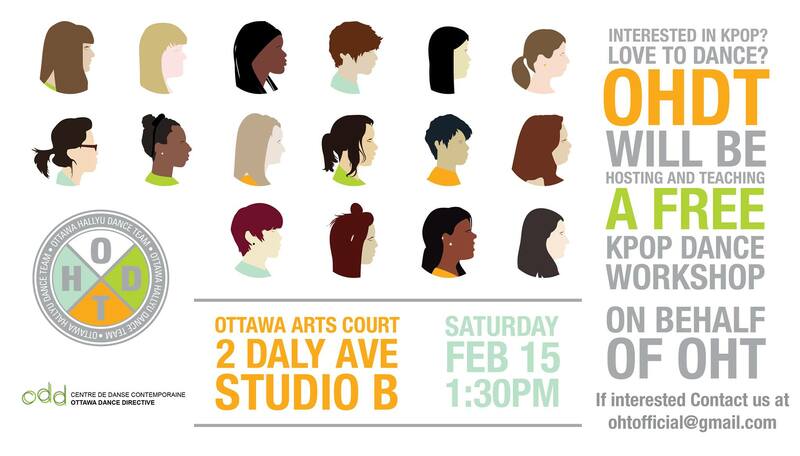 The Ottawa Hallyu Team is extremely excited to be hosting in collaboration with the Ottawa Hallyu Dance Team, their first event tomorrow, Saturday, February 15! Do you like Kpop? Do you like to dance? Do you like free food? Then come out to a free Kpop Dance Workshop at the Arts Court on 2 Daly Avenue for the first ever OHT event! Too shy? Nothing to worry about, there will be refreshments and ice breaker games during the down time between the two workshops! Different choreography will be taught at each workshop so we urge members of the community to come out to both if possible! The workshops will be held in Studio B on the second floor from 1:30pm to 3:30 pm and then once again from 5:30pm to 7:30pm! Come out and get your dance on with some great music and friends! For any questions/inquiries, feel free to send an email to ohtofficial@gmail.com and don’t forget to RSVP to our event on Facebook! Hope to see you there!